Art Competition for Children: ‘Science, a Human Right’. 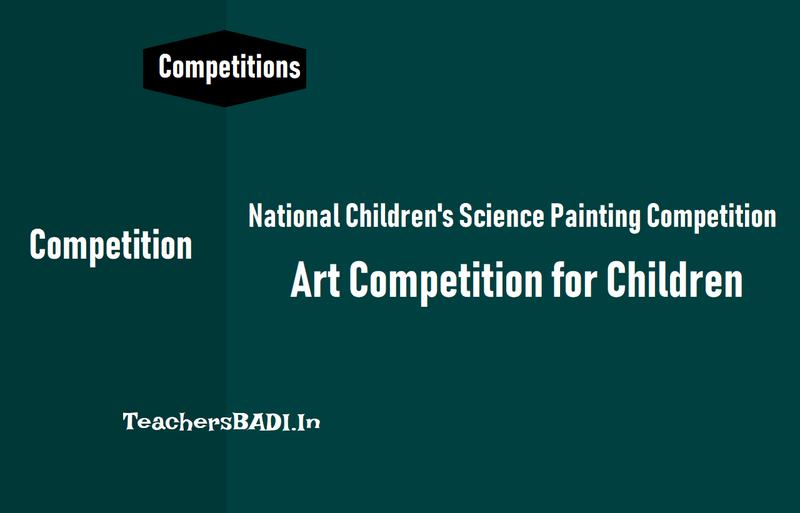 National Children's Science Painting Competition(Art Competition for Children) 2018: With the support of UNESCO New Delhi Office, United Schools Organisation of India (USO), in collaboration with National Institute of Science Communication and Information Resources (NISCAIR), is organizing the National Children’s Science Painting Competition. Open to students of Class I – XII, the competition shall be held on October 15, 2018 at 9.30 a.m. in schools all over India, on the theme of the 2018 World Science Day for Peace and Development (10 November), ‘Science - a Human Right’. The main aim of this competition is to highlight the importance of science in our everyday lives, and encourage young curious minds to link science to their daily activities. One student from each grade in every school shall receive the ‘Best Entry Standard-wise’ award; and also state-level and national winners shall be selected. Paintings of the winners shall be printed on a calendar to be published by USO, with due credit to the schools and winning entries. Last date to registration: 5 October 2018. Rc.No.4360: SCERT,Telangana State, National Children's Science Painting Competition: The attention of all the District Educational Officers in the State is invited to the references read above and it is informed that the United Schools Organisation of India, USO House, New Delhi is organizing the National Children's Science Painting Competition in collaboration with CSIR-NISCAR with the support from UNESCO on 15.10.2018. This year's theme from UNESCO is 'Science. A Human Right. The competition is open for students all over India of standards I to XII. The organization shall be awarding certificates to all participants and shall be selecting winners State-wise and Nationally. The winners shall be getting special certificates, medals, trophies. The details of the competition is enclosed with the above letter for kind perusal Therefore, they are requested to follow the guidelines attached with the letter and take necessary action immediately. 6. Schools to send 5 paintings from each standard to USO offices in New Delhi (United Schools Organisation of India, USO House, USO Road, 6, Special Institutional Area, New Delhi 110 067). USO NISCAIR UNESCO to select the 'Best Entry: Standard-wise (1 entry for each Standard from each school). Judging criteria Creativity and originality, Artistic Ability based on age, Message (of theme). Overall impression. e-print publications and mediums, display in offices, or any other platform they see fit. Paintings of the National winners shall be selected for annual calendar with due credit given to school and student. The decision of USO, NISCAIR and UNESCO is final and binding on all.